There is nothing exciting about getting your period. When it arrives, you know you will be cramping, bleeding and bloating for the next five to seven days. Worst of all, at times it can seem like everything is just going wrong for us during this time too. Maybe you get a flat tire, or maybe your local grocery store is out of Rocky Road Ice Cream. Sometimes it is hard to keep our emotions in check every 28 days, and if you are feeling the emotional tidal wave arrive, here are some tricks you can try to help you stay calm. Sometimes you just need to give yourself a bit of TLC during your period week. Spend a few extra minutes in the shower with your favorite wash, apply a great moisturizer to your skin, or go and get your nails done at the salon. You deserve to pamper yourself a little bit! If you find you are about to explode on your mom or best friend, go for a five minute walk and cool down before coming back to the situation. You may need to explain to them that Aunt Flo is in town, and that you needed a few minutes to yourself. We are sure that they have been there before, and will completely understand. Junk food and greasy french fries may sound good in the moment, but they will leave you feeling bloated and lazy. Try eating some fresh fruit, drink some extra water, or make a delicious cup of Chamomile tea to help you stay calm and feeling good. Many times stress can just get to you during your period. Stress management is a technique used by many women to help control emotions during this time of the month. 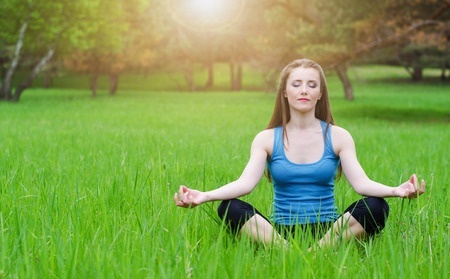 Try performing relaxation techniques such as meditation, deep breathing and even yoga to help with mood swings and emotional changes. If you feel your emotions change during your period and are feeling completely overwhelmed, don’t hesitate to talk to your primary care doctor or OBGYN the next time you have an appointment! And for all-natural menstrual cramp relief, try giving Comforté a try.